Brazilian-led bid, co-sponsored by Argentina, is shot down by abstentions and lobbying from pro-whaling nations. A proposal to create a whale sanctuary in the South Atlantic has been defeated at a crunch meeting of the International Whaling Commission (IWC). Pro-whaling nations on Tuesday blocked the near two-decade effort to create a haven for the endangered marine mammals, deepening divisions at an already fractious IWC meeting in Brazil. 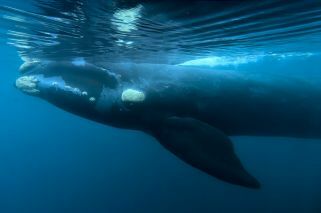 The South Atlantic Whale Sanctuary was backed by 39 countries with 25 voting against and several countries not casting a vote, and so failed to get the required two-thirds majority from the 89-member body. Opponents of the plan argue the science doesn't support the case for a sanctuary. And they say it's not necessary because there isn't any commercial whaling occurring in the South Atlantic. Brazil's Environment Minister Edson Duarte, whose country has proposed the creation of the sanctuary since a 2001 IWC meeting, said he was disappointed but would continue to call for worldwide support in the future. "As minister for the environment in a country with 20 percent of the world's biodiversity in its forests, we feel highly responsible for the stewardship of our wealth, for the whole world, and this goes for cetaceans as well," Duarte said to applause from delegates. Pro-whaling nation Japan voted against the project. The Japanese delegation has pushed for a rule change at the biennial meetings that would allow decisions to be made by simple majority instead of the current three-quarters majority. This would make it easier for Japan to push through its proposal to end a 32-year moratorium on commercial whaling and re-introduce "sustainable whaling," much to the ire of those nations that are against the practice. It would also, as Japanese Foreign Ministry officials pointed out at the Brazil meet, have enabled the creation of the long-envisioned South Atlantic Whale Sanctuary. New Zealand's Commissioner Amy Laurenson, speaking in favour of the sanctuary, told the meeting it was about protecting whales, "not about determining the outcome for other areas of the world." The deadlock illustrates the divide in the commission, where some countries think whales can be hunted sustainably and others want more conservation measures. The commission banned commercial whaling in the 1980s, but Japan is proposing to reinstitute it with catch limits. Six member nations did not send delegations, while seven countries that did – most of them African – have not paid their fees and were not allowed to vote. Railing against "the destructive blockade of some countries," he said the CMS states should go ahead without IWC approval to form the sanctuary. "A sanctuary in this region would have provided strong protection to a wide range of whale and dolphin species," said Patrick Ramage of the International Fund for Animal Welfare. "Non-lethal whale research in this area has already provided valuable data on whales and a sanctuary would have built on this further, giving us far more useful and precise information than has ever been gained from so-called scientific whaling." "The nations of the region want to create – and they have every right to create – a safe haven for whales under continued threats from commercial whaling, death from entanglement in fishing gear, marine pollution, and injury from ship strikes," said the HSI's Delgadillo.